I’ve been collecting links to resources on the use of visual thinking in teaching and learning. Here are three resources that go well together. Each is an example of the use of concept maps in a physics class. At the Beginning – “Physics 292: The Big Picture” is a Prezi that Ian Beatty (UNC-Greensboro) shared with his physics class last August. Not only is this an excellent example of how to use panning and zooming in Prezi, but it also shows how you can describe an entire semester’s worth of content in a single, big concept maps. Cognitive science tells us that experts in a field have robust mental models of the concepts and relationships among concepts in that field. Novices, like our students, lack those robust mental models. Building those models is hard work, but sharing a visualization of one’s own mental models with students helps them start to refine their own. Also, I like the idea of using a concept map like this one to give students a preview of what they’re going to learn in a course. This is a great first-day-of-class tool. 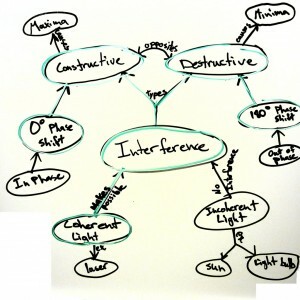 In the Middle – Back in the fall of 2010, Patrick Len (Cuesta College) asked his second-semester physics students to create concept maps focusing on particular topics, staying cool and interference. You can see the results (along with a few action shots of the students) in this Flickr set. Focusing on particular topics yields smaller, simpler concept maps, but there’s a still a good deal of work involved in selecting associated concepts and identifying connections. From the action shots, it looks like Patrick had his students work in small groups to create these concept maps, which is a smart thing to do. In-class, small-group activities work best when each group has a clear deliverable, and requiring a group to come to consensus on the design of a concept map is a great way to encourage students to discuss and debate course content. Update: Patrick tweeted that his use of concept maps was inspired and informed by that of Peter Newbury (Univ. British Columbia), who has written a paper on using concept maps in astronomy courses. At the End – Just yesterday, Andy Rundquist (Hamline University) blogged about his use of concept maps as part of a final exam in his physics course. The course used standards-based grading (see his syllabus for an overview of this strategy), so he had a handy list of about 30 learning objectives (“standards”) for the course. For their final exam, he asked his students to create a concept map using these standards. Since the nodes of this concept were given, their job was to identify connections among those nodes. Then each identified the standard with the most connections and wrote a one-page narrative “describing why that standard is such a central idea for this class.” Andy didn’t assess the concept maps (although he could have), but he found the narrative useful for determining how well his students understood the “big picture” of the course content. Just as “big picture” concept maps work well to introduce a course, they also work well as a summary at the end of a course. I know many instructors interested in concept maps are hesitant to use them because they’re unsure how to assessment. Andy’s addition of a one-page narrative seems a sensible solution to this challenge. Update: Andy graciously shared an example student-created mindmap. And then he shared two more. Each of the three are constructed so differently, which I find fascinating. I’ve been thinking about how to incorporate concept maps in my spring course, which starts Monday. I have a sketchy “big picture” map of the course material, but I don’t know if I want to polish it up and share it with my students. I might have students construct “big picture” maps of the course iteratively, maybe a three different points in the semester. I’ve been working with a Teaching-as-Research Fellow, Tamara Carley, who did something similar in an earth materials class using Prezi for multi-scale concept maps. Since I’ll be only loosely following the free, open textbook I’m using, perhaps such an activity would help students keep the course material organized. How about you? Have you used concept maps in your teaching? Please share in the comments section. 4 Responses to "Concept Maps at the Beginning, Middle, and End"
Thanks for continuing to provide support for and example of visual thinking from different disciplines/perspectives. We’ve benefitted greatly from these resources and have many faculty making big improvements in this area at CMU. You’re welcome, Andy! It’s always great to hear people reading and using my stuff.